The chemicals characteristic of living systems are incredibly complex. This is a major issue, because there are only two options for the origin of a cell: they either are the product of natural, unguided pre-life processes or they are the product of intelligent activity, such as offered by a Creator God. Philosophically, both are possible. The issue then becomes whether the tools of science lead us to prefer rationally one over the other. The following discussion will illustrate the extreme complexity of biochemicals. The discussion is primarily focused on proteins. First ,we will look briefly at metabolic pathways. The mutual cooperation between various proteins required to accomplishing the tasks necessary for life will be presented. Second, we will calculate how long it should take natural processes to make a protein. These calculations show that there should not be even a single protein composed of even a mere amino hundred acids any anywhere in the universe. Yet, the proteins used in life are composed of an average of about 400 amino acids. Notice, this ruins any hope that astrobiology could offer any help for the origin-of-life problem. It is interesting that behind the scenes, NASA considers the origin of life a grand challenge problem. This is not how they talk about it to the public. This is discussed in more detail in our website here. Obviously, evolutionists do not like these kinds of calculations, because they are so extreme. Their extremity clearly teaches against any rational possibility that natural processes could have created the life we see so evident around us. Evolutionists have no choice but to either make an attempt to discount the calculations or to admit openly that scientific observation favors special creation. So, they try to discount them. However, their reasons do not hold up under examination. The immediately following discussion on Metabolic Pathways puts the discussion of the calculations into a real life scenario. We will show how a very real problem concerning a natural origin of life confirms the legitimacy of the calculations. Hopefully, this will make the calculations more meaningful as well as easier to apply to real life. It is recommended that our article on the ribosome be read together with this one, as the two supplement each other in providing a single argument about the difficulty of life emerging from random sequences and the significance of this difficulty. The ribosome article shows the necessity of the first appearance of a ribosome being single-step in already fully-developed form. This article primarily focuses on calculations showing just how difficult it is for random processes to from the chemicals of life. A metabolic pathway in a cell is a linked series of chemical reactions, catalyzed by enzymes (proteins). Along the pathway, the output product of one enzyme becomes the input to the next. The diagram to the left shows a metabolic pathway related to energy production. It may be clicked on for an enlarged view. This diagram is amazing. The steps flow naturally from one to another. A creationist views this diagram as a testimony of the wisdom and power of the Creator God, who first planned how it would all tie together and then used His divine power to form it as a complete working unit. Its first appearance in the world was as part of a complete, lyoutside of the normal laws of physics and chemistry to do so. At this point we will show just how complex proteins are and just how difficult it would be for natural process to make a specifically required one through the random processes available for pre-life processes. Implementation of the metabolic pathways used in living cells requires groups of proteins to make a simultaneous first appearance, otherwise none of them have value, even as we just discussed. In order to do the analysis that follows, we will make some assumption that unrealistically favor abiogenesis; even so they will still demonstrate its extreme implausibility. Just remember that in the real world the situation would be far worse that what is represented by the assumptions shown here. Let’s consider the difficulty it would take for random processes to form three different proteins. The first protein is made of 100 amino acids, the second 200 amino acids, and the third 400. In our scenario, all three of them need to make a simultaneous first appearance before any of them have value. There are twenty choices of amino acid per position within a protein, with many positions requiring an exact choice and others allowing limited substitutions. For the sake of simplicity, assume that there is an average of two choices suitable for each position, meaning that the average odds of getting a suitable choice are 2 in 20 for each position. Mathematically, this reduces to 1 in 10. In such a case, the odds of a protein forming its required shape from a random assortment of amino acids would be equal to the number 10 with an exponent equal to its number of amino acids. This is unexpectedly convenient. So, the odds of getting a usable shape for the 100-amino acid protein are 1 in 10100. For the 200-amino acid shape they are 1 in 10200. Finally, the odds of getting the 400 amino acid shaped properly are 1 in 10400. Abiogenists are very familiar with these kinds of odds. However, they act like they pose no major threat to abiogenesis and basically ignore them. We will show that the problems presented by these number are serious enough to make a natural origin of life impossible. There are an estimated 200 billion (=2x1011) galaxies in the universe with an estimated average of 200 billion stars per galaxy. This gives an estimated total of 4 x 1022 stars in the universe. Suppose each star has one planet revolving around it in the “goldilocks zone,” neither to hot nor too cold for liquid water to exist. Also suppose that planet is the size of the earth. 200,000,000 square miles, the area of earth’s surface. is 62.5 pounds per cubic foot. 2 x1045 a hypothetical total of pounds of amino acids in the universe (2 x 1043 x 100). in the number of grams of the molecules equal to the molar weight of the molecules. conditions, which unrealistically favor chemical evolution. A living cell is extremely organized with many interdependencies. Evolutionists like to say that evolution has no goal. This sounds more like sales rhetoric that an analysis of living systems. Our opening discussion on the Metabolic Pathway Chart showed how specific proteins are needed to implement pathways for certain essential processes; missing any of the proteins on it is potentially fatal. Beyond this, cell replication, protein translation, the formation and control of an active, dynamic cell membrane, etc. must all be present in working condition for a cell to be capable of sustaining life. These functions depend on a large number of very specific proteins performing different, specific, mandatory tasks. A genetic defect or mutation is frequently fatal to the entire organism if it causes even a single protein to malfunction. These applies for everything from bacteria to people. In an organized system, it frequently doesn’t matter how much you have right. It is what you don’t have right that presents the problem. For instance, in 1986 the space shuttle Challenger exploded 73 seconds into its flight, killing all seven people on board. The problem: an O-ring failed, allowing rocket fuel to leak where it shouldn’t. It did not matter that two billion dollars worth of everything else worked fine. A defective gasket destroyed it. Anyone who has ever used a computer to any degree has probably experienced a crash which was ultimately caused by a single errant line of code hidden in some obscure routine. It rarely showed up, but when it did, it was fatal. When a computer crashes, it doesn’t matter how much was right. The only thing matters is that a tiny problem was all it took to prevent the rest of it from functioning; the “tiny” problem was fatal. This is an important perspective, because we are going to talk about numbers so incomprehensibly large that it becomes easy for our minds to flip and ignore their significance, treating them as if they were not a problem. But they are. When we talk about how difficult it is to get a specific protein to appear, this is a serious issue. But its seriousness is compounded when one recognize that a living bacterium still uses over 1,000 different kinds of proteins. In most cases, only missing one of them prevents the cell from living. Yet, natural selection can do nothing to solve the problems of a non-living organism. Let’s discuss the difficulty for random processes to produce the 100-amino acid protein discussed earlier. 1070 number of amino acids hypothetically available within the entire universe from the above calculation. try, from our earlier discussion. This represents a rather dilute solution. 1 in 1017 = 1 in 1032 / 1015. 1 in 1017 (=1 in 100,000,000,000,000,000) are the odds against the protein being sequenced correctly for a one hour period by purely random processes anywhere in the universe throughout its hypothetical 100 billion years of existence. Yet, this is for a small protein, one only 100 amino acids in length. All of the proposed new attempts did not increase the concentration of the protein very much. It is still effectively zero throughout the entire period. The second protein in our opening, 3-protein complex uses 200 amino acids to produce its required shape and characteristics. Every time an additional amino acid is added to the chain, the odds against it appearing correctly increase by an average of 1 in 10. This adds another zero to the odds against it and also multiplies by ten the average length of time for it to appear. So, the new, 200-amino acid protein will be 100 amino acids greater in length than the first. This means it will take 10100 times longer to appear than the first one did. This is a Googol times longer. This is serious. The 200-amino acid protein is very unlikely to appear for even one hour on any planet in the universe in well over a Googol years. This is a truly serious problem. One also needs to be aware that the average protein size is around 400 amino acids. One of only 200 amino acids is relatively small compared to most of those found in a living cell. Somehow, when biologists talk as though a billion years in an isolated, tiny pond on earth would offer such a long time that it should offer many opportunities for life to appear, it seems they have not faced the implications of certain very well known and understood facts. Here is the problem. In our scenario, both of the proteins need to appear at a specific, given molecular location and also at the exact point in time they are needed. Yet, one of them might have appeared for an hour and then disappeared 3 billion years ago in a distant galaxy located 14 billion light years north of us. The second might possibly not show up for more than a Googol years from now in another distant galaxy in another direction and then for only an hour. How do we detect them and them bring them to the specific molecular location in which they are needed within the hour before they decay? An hour is not much time to travel a distance of 14 billion light years, even if we could identify it, select it, and transport it. When we talk about the chemicals of life being complex, this is what we mean. (10300 years) is not long enough for a single instance of a protein of 400 amino acids to be even remotely likely appear on a single planet located in some galaxy somewhere in the universe. This is even with completely new, random sequences being formed every hour over the entire duration. This was after making all kinds of unrealistic assumptions favoring chemical evolution. The above observation is significant because a protein of 400 amino acids is generally considered to be of average size. Sizes of 600 to 800 are reasonably common and even ones of over 1,000 occur with some regularity. If a specific molecular reaction needs a specific protein to be immediately present for its use and if the odds are strongly against it appearing anywhere in the universe within a Googol years, then it is unlikely that the reaction will take place. If this is needed for a required functioning in an emerging cell, it is unlikely for the cell to form. If a metabolic pathway requires a number of proteins to work together to accomplish a particular function and if that function does not get accomplished unless all of the proteins in the pathway are present in working condition, it is unlikely for that pathway to appear. Until the first cell appears with all of its components in working condition, there is no means to make the components. Random processes are simply unable to accomplish this, as we have just shown. Sometimes evolutionists propose that it is not truly difficult to form a needed protein. This is because in life there are lots of substitutions between various amino acids at various positions in a protein. In recognition of this we allowed a choice of 2 alternates per position, which for various reasons seemed reasonable. However, as a side note it is worth pointing out that with odds as great as those above, even if there choice was only between 2 amino acids for each position instead of 20, the above number would only be reduced from 10300 to 1090 (it is reduced by the ratio of the logarithms of the bases, for those of you who are mathematically minded). Even these odds would be formidable to overcome. The reality is, the difficulties of getting useful proteins by natural, random processes are effectively insurmountable. Consider the Krebs Cycle as an illustration of a real-life situation which demonstrates the problem facing abiogenesis. It is used by every kind of cell that uses oxygen to burn fuel, whether microbial, plant, or animal. It is a circular pathway and is shown of the chart of Metabolic Pathways. Nine enzymes (proteins) are used to perform the cycle. The number of amino acids in each of these proteins in ascending sequence is (136, 413, 437, 466, 510, 617, 708, 868, 1117). In the light of our discussion, under the hypothetical scenario of every star in the universe having a planet with a 20 mile solid stack of proteins changing their structure and no repeats, the odds are still overwhelmingly against a single instance of any (including the first) of these having appeared anywhere in the universe for one hour since the hypothetical big bang. Most would be unlike to appear even once anywhere within the next Googol years. Yet, it takes all 9 of these working in cooperation to burn carbon compounds as fuel in order to make ATP, which is the common energy currency of the cell. In general, if there is no ATP, nothing else in the cell functions. For instance, a ribosome cannot function without an energy source. However, ribosomes are what a cell uses to make proteins. Unless all of the proper proteins are already in existence in a system which allows the Krebs cycle to function, there will be no source of ATP to energize the ribosome for it to make the proteins to make ATP. Basically, as discussed in the earlier referenced article on the ribosome, the issue boils down to a choice between gradual emergence over time by evolutionary processes or a sudden, single-step, completed first appearance. Since the above discussion shows the extreme difficulty of having even an isolated appearance of a single instance of a 400-amino acid protein, the sudden appearance of a fully functioning cell is rationally outside the capability of natural processes. This is not a problem for those who are willing to accept special creation, but it is to those who are not. 1) Natural processes do not provide the required building block materials of amino acids and RNA nucleotides in a form that is useful for the subsequent stages of abiogenesis. A natural origin of life is actually unable to “make it out of the starting block.” The Miller-Urey experiment with all of its tested variations in energy source, initial components, and environmental conditions, represents an initial, first stage process. These products are consistently unusable by future steps because of a) too many contaminants, b) wrong absolute concentrations, c) wrong relative concentrations, d) wrong chirality, and e) too great a tendency to form tar instead of required products. The hypothesis of Abiogenetic Disconnects, developed in the booklet described on our home page and also available here discusses this and many more problems. No scientist uses the product of the Miller experiment or the variations of it for subsequent experiments, because they are unusable. Basic laws of science prevent them from being usable. Unless this problem is overcome, everything else in abiogenesis is science fiction. It is useful only for tickling the imagination, but has nothing to do with real life. 2) Gradual emergence does not work to form the tools (ribosomes, information in DNA, energy source, etc.) that need to be used to implement gradual emergence. These tools need to be in working condition in order to provide the mechanism for gradual processes to use. Ultimately, this means that the first living cell needs to be formed using random processes. These are the very processes our calculations show to be so extreme in the obstacles they present. 3) A hypothetical self-replicating molecule does not solve the problem of the lack of necessary tools. For example, a self-replicating molecule is so remote from providing the kinds of components needed to build a ribosome that discussion about it is empty. It diverts attention from the big problems without dealing with them. There are no proposed, hypothetical, experimentally testable and observable steps that would lead from a self-replicating molecule to a functioning ribosome or its equivalent. The observed problems are real. The hypothetical solution using the self-replicating-molecule offers nothing to solve the observed problems. It is sad to see how so many “scientists” make essentially absolute claims about this molecule. Richard Dawkins, the British Biologist famous for his attacks on creationism, is a leading proponent of this. Specifically, the claim is that once a self-replicating molecule appeared and had reached the point that some of the species could be modified by alternating cycles of mutation and natural selection, that life had then begun and the appearance of the modern cell would only be a matter of time. They make strong statements without any form of experimental justification. This is not science, it is science fiction. 3A) Self-replicating molecules (replicators) consume nucleotides but do not build them. Currently, there is no known pre-life process that is able to provide a supply of nucleotides for use as feedstock for the molecules. There is no observable scientific basis to expect them to appear in real life, as discussed above. 3B) There is no energy source to drive the nucleotide assembly processes. Typically, it takes one ATP molecule to energize and connect one nucleotide to an emerging RNA string. Self-replicating molecules would consume ATP (or its equivalent) but do not make them. In an aerobic living cell, ATP molecules are generated by the Krebs Cycle, which uses a group of nine extremely complex proteins to do this. There is no way that a single RNA strand can perform the functions of the Krebs Cycle. 3C) One would anticipate that replication would grind to a halt because of parasites. A parasite is any kind of RNA string, such as products of a decayed replicator, which would be copied by a replicator and consume RNA and ATP, but not result in the appearance of a new replicator. Being smaller than replicators, they would be more active and preferentially copied. It is plausible that In time, only parasites would be left to be copied. 3D) RNA has an exceedingly short life span. The typical half-life of messenger RNA is well under a day. It would not take a very lengthy interruption in the replication process due to the above reasons to result in the replicators decaying while in the middle of replication while waiting on new resources. It is conceivable that all of the replicators could die off while waiting on resources. The gap is huge between replicators, which only consume and don’t manufacture anything, and living cells, which manufacture all kinds of cellular components needed for their continued operation and survival. Replicators do provide any solution to the problem of simultaneous first appearance of the complex systems needed within a living cell. For instance, the appearance of a ribosome is essential for the appearance of a living cell, but is useless for a replicator. Replicators are only an interesting, hypothetical novelty down an inadequate side path. 4) As an additional comment, evolutionists like to hypothesize an RNA world which reputedly existed before our current form of life. The RNA world would hypothetically use RNA for both information storage and for all of the functions performed by amino acids at the current time. RNA is not nearly as efficient as amino acids in forming specific shapes to accomplish enzyme activity. What would an RNA cycle look like that could burn carbon-based fuel to make ATP molecules, if this is even possible? No one has any clue. The ribosome article referenced earlier discusses among other things that a ribosome self assembles. The characteristics controlling and determining the steps of self-assembly are built into the structure of the various components making up the ribosome. Actually, there are many systems of a cell that self-assemble, not just the ribosome. This adds tremendous complexity to an already complex situation. It requires not only the ability for components to recognize where they need to attach for self-assembly, but also the ability to discern where they should not attach, so as to preclude false assembly. Amino acids offer potential resources to help prevent false assembly, such as electrical charge. RNA doesn’t. RNA only has sequences of nucleotides to offer for a solution to the problem. One may speculate that in a system with extensive self assembly of subsystems, that avoiding false assembly could become an even bigger problem than performing actual self assembly. One may suggest the possibility that RNA by itself may not have the ability to self-assemble complex systems such as ribosomes and other cellular features. One may also suggest that even if they could do this in an isolated environment, such as in an experiment, that they might not be able to do so in a living cell, where the issue of potentially greater exposure to opportunities of false assembly might be beyond RNA’s capability to deal with adequately. If this is the case, then it appears that the entire RNA World hypothesis would fall apart and not be viable. When chemical engineers design processes using flowcharts this complicated, they typically need to go through a long debug process to get everything to work together properly. This in turn requires specialized test equipment which allows individual steps and flows to be tested and analyzed and then fixed as necessary. Eventually, after successful debug of small portions of a complete system, the system can perform well enough to give a “Go” when tested. By contrast, natural processes do not have debug mechanisms. Nature does not provide the tools necessary to create designs with flowcharts this complicated. Even relatively intelligent people can become overwhelmed when they see a chart like this, with all of its inter relationships and interconnected flows shown on the chart. When one recognizes that in a complicated system it is irrelevant how much is correct if there is a failure of any critical component or step, then another major problem appears. Natural selection only tests at the level of a completely working system. A system cannot be gradually built, component by component, with natural selection helping build an improvement the individual components until they will work properly once they are placed in a system. Evolutionary processes do not create metabolic pathways. The difficulties facing abiogenesis are compounded when the various individual enzymes shown on this chart are so complicated that most of them would not appear anywhere in the universe in over a Googol years through random processes in unrealistically favorable conditions. Yet, individual enzymes decay long before this. The situation becomes like trying to build a house when it board rots and decays before the next one is attached to it. Furthermore, the incidental appearance of a required enzyme does not give the ability to reproduce it. This is part of the problem in the “information first” or “metabolism first” controversy which has so polarized abiogenists. To believe that an uncontrolled source of energy such as sunlight shining on initial raw chemicals could produce this degree of complexity in less than a billion years or so is irrational. Science justifiably looks for explanations of natural law without calling on a God. However, science does not have the tools to constrain God’s behavior to test Him and His limits in an experiment. Hence, science does not have the authority to make any direct analysis or statement about God’s presence or actions. However, this does not mean that God does not exist. It does not mean that there is not a God who is able to work outside of natural law at will, either now or in the past. It only means that scientists cannot invent an experiment to control Him and test Him. By contrast, from a creationist perspective, the things we just discussed flow naturally from the understanding that an extremely intelligent personal God planned and implemented the existence of living organisms. The Metabolic Pathway Chart flows from His creative intelligence. Seeing a chart like this is not perplexing to the creationist, it is conformation to him of the wisdom and power of the God he loves and serves. He views the intricate use of components which natural processes cannot form anywhere in the universe in a Googol years as a testimony of his God’s power to work outside of natural law, because He did things to put us here which are beyond the rational capability of natural processes. To a creationist, it appears His God not only designed processes and components of life, but He even designed them in such a way to show that natural processes are incapable of replacing Him. When atheistic evolutionists claim that science has shown that there is a natural explanation for everything and that God is no longer needed, it appears to the creationist that the atheist speaks as a fool. No, the tools of science do not legitimately teach away from God’s existence and power, they reveal it, albeit indirectly. Any efforts to present natural processes as an alternative to His creative efforts consistently lead to dead ends, contradictions, and unreasonable assumptions and conclusions. Their failures are on a truly grandiose scale. The tools of science clearly lead us to understand the appearance of life as the handiwork of a living, intelligent Creator God, One who is not bound by natural law and has the power to work outside of it. Praise Him for His wisdom. Thank Him that He has given us the intellectual capacity to be able to see His greatness in what He has done and appreciate Him in it. 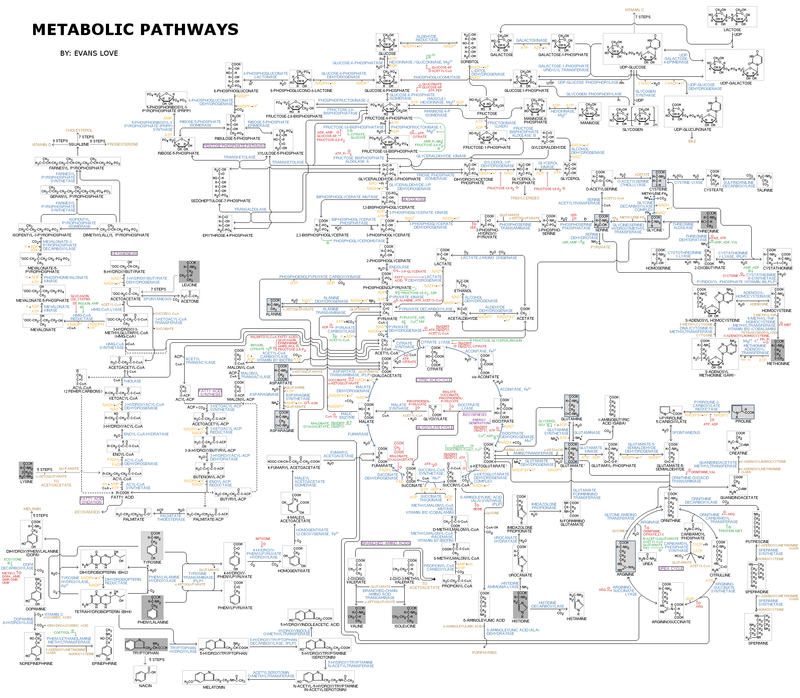 The illustration of Metabolic Pathways by Evans Love was retrieved from https://en.wikipedia.org/wiki/Metabolic_pathway on November 12, 2016. License is per Creative Commons as discussed on the Wikipedia page. fully functioning cell. The Creator God worked outside of the normal laws of physics and chemistry to do this. The materialistic evolutionist faces formidable difficulties in an effort to account for a like this solely by unguided, natural processes. Wherever he looks, he finds problems. For instance, a pathway is like a course in a relay race. The individual proteins making up the pathways are like the individual runners in the race. In a race, a baton needs to be passed from runner to runner without being dropped until the finish line is reached. Otherwise, the entire team is disqualified. In a metabolic pathway, the chemical that needs to be transformed is called a substrate. As a substrate passes from protein to protein, it Is gradually changed until it appears in the desired target form. Natural selection has nothing to work with until everything works and is part of a living, reproducing organism, because natural selection only selects among organisms that are already alive. It is has nothing to work with to develop a metabolic pathway for a still non-living, non replicating group of chemicals, such as those that would represent a nonfunctioning pathway. It is amazing how they try to talk around this issue in an effort to avoid dealing with its seriousness. The diagram shows multiple series of pathways that are all interconnected. The proteins are represented by the words in light blue letters which end in “–ase.” Notice how many proteins there are. Most of the proteins shown on the chart are required for a cell to survive; in general if any of them are missing due to a mutation or some other kind of birth defect, the cell using the pathway cannot survive and dies. As a comment, this is the chart for a human being. Plants and bacteria have different charts. However, each pathway is particularly suited to the needs of the organism it is associated with. An evolutionist might be tempted to use the variation in pathways between different kinds of organisms as evidence of evolution. He needs to be careful here. If production of a pathway truly is beyond the capability of natural processes to form, then the differences between kinds of organisms become a testimony of their separate creation, not of of evolution. There are two issues of concern to the evolutionist. The first is that realistically, all or at least a large number of the proteins shown here need to make their first appearance as part of an already working cell. Missing any one of them kills the cell. Natural selection only knows that the cell is not alive and potential improvement to bring it closer to life cannot be selected for. 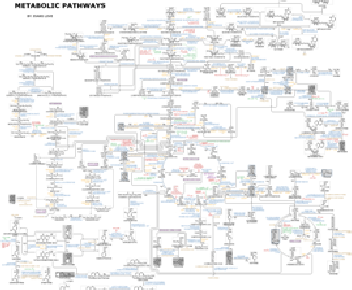 Either the complete metabolic pathway works properly or it doesn’t. Natural selection is powerless to create the proteins for the various steps along a metabolic pathway which does not yet exist. It only selects among differences between already living and reproducing organisms. So, how did all of the interconnected pathways on this diagram appear? Ponder this as you look over the diagram. The next issue concerns the high complexity of the proteins. If proteins were simple molecules, such that a needed one would typically randomly appear every few days or so, then a group of them might occasionally appear in working form through chance, given enough time. However, that is not the case here. Most proteins are so complicated that a single instance of them would not be likely to appear anywhere in the universe in a Googol years, as we shall see. To get a large number of them to appear at the same molecular location at the instant in time they are needed will simply not happen on a regular basis required to implement the pathway. Yet, this is what science teaches us would need to happen for a natural, unguided, materialistic origin of life to take place. So, how can a diagram of this complexity form out of nothing when none of the individual components should have ever appeared anywhere in the universe even once? How can evolutionists be so blind as to be unable to see something so powerful in its implications and so obvious as to its truth? This will be looked at again, later, when we show how the hypothetical self-replicating molecule offers no help in resolving these kinds of problems. Counter installed November 14, 2016.